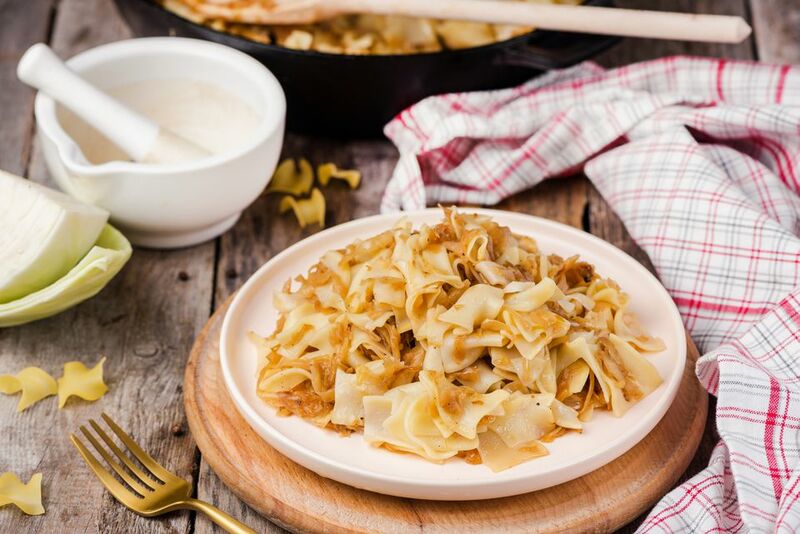 This Hungarian comfort-food dish known as kaposztás tészta is a simple recipe to make, consisting of cabbage, onion, butter, egg noodles, salt, and pepper. Cabbage with noodles is a popular and easy dish common throughout Eastern Europe. In Poland, it's called kapusta z kluski or hałuski, in the Czech Republic, it's known as nudle s zelí, and Slovaks call it haluski (without the accent on the "L" as in Polish). This can be a strictly vegetarian dish, sometimes with added sautéed mushrooms, or can be enhanced with bacon or other smoked meat, and it makes a terrific side dish or main-course offering that holds up well on a buffet table. If this recipe doesn't tickle your fancy, there are many more Eastern European cabbage recipes to choose from. In a large skillet or Dutch oven, sauté cabbage and onion in butter until golden brown and tender. Mix with cooked egg noodles. Adjust seasonings and rewarm if necessary to serve piping hot. Add 1 cup sliced button, cremini or other mushrooms to the skillet with the cabbage and onion, and cook until they are all golden brown and tender. Before serving, add 1 cup cooked, crumbled or diced bacon to the cabbage, onion, and noodles mixture. After mixing the cabbage and onion with the noodles, add 1 cup chopped ham combining well and rewarm to serve hot. Basic Hungarian Noodle Dough Recipe: This egg dough can be transformed into thin noodles, wide noodles and everything in between. Tarhonya or Grated Egg Noodles Recipe: These noodles are made by grating chunks of noodle dough instead of rolling and cutting. They are dried and used in soups or browned in butter as a side dish. Hungarian egg noodles, known as Magyar tojasos teszta (MAHG-yahr toy-YAH-shohss TESS-tah) or metelt (MEH-telt), come in a staggering number of varieties, rivaled possibly only by Italian pasta. Hungarians roll them, cut them, pinch them, grate them, and drop them. There's a noodle for every dish and a dish for every noodle. Teszta is actually the Hungarian word for "dough" and metelt means "noodles," but they are used interchangeably. When the word tojasos is added, we're talking about egg noodles, the pride of Hungarian cuisine. They are made with three simple ingredients—flour, eggs, and salt—and, in some kitchens, not even any salt. No water or oil is added to authentic Hungarian noodle recipes because many cooks feel the addition of water creates longer drying times and increases the potential for the noodles to mold when stored.